GBC-elected guru HH Kadamba Kanana Swami explains the danger of being, and accepting, a false guru. However, he ends up simply condemning himself. Quotes in the shaded boxes are from a lecture Kadamba Kanana Swami gave on 5/9/18. All emphases added. "However, when a guru speculates, when a guru manufactures, when a guru comes up with his own ideas, then he is not a guru at all. At that point, he is a false guru, and being a false guru is a very serious offence." This definition fits Kadamba Kanana Swami himself. For we have clearly exposed Kadamba Kanana Swami speculating, manufacturing and coming up with his own ideas in previous BTP issues (BTPs 58, 49 and 16). For example, in BTP 58 (QNN, "The Solution to Deviant Philosophy"), he claimed the opposite of Srila Prabhupada, by stating that external circumstances are the causes of difficulties in Krishna consciousness, whereas Srila Prabhupada states that this is a "mistake of judgement". And thus, by his own definition, Kadamba Kanana Swami has committed "a very serious offence." "No, a guru is meant to point us towards the Supreme Personality of Godhead. The Vayu Purana says how an acarya is the one who knows the scriptures, who follows the scriptures and who teaches the scriptures to others. That is the point." "The spiritual master is also called acarya, or a transcendental professor of spiritual science. The Manu-samhita (2.140) explains the duties of an acarya, describing that a bona fide spiritual master accepts charge of disciples [...] The duty of the spiritual master is to initiate a disciple with the sacred thread ceremony, and after this samskara, or purificatory process, the spiritual master actually begins to teach the disciple about the Vedas. [...] In the Vayu Purana an acarya is defined as one who knows the import of all Vedic literature, explains the purpose of the Vedas, abides by their rules and regulations, and teaches his disciples to act in the same way." Thus, Kadamba Kanana Swami refers to evidence that the Acarya acts as the diksa guru. And, as it has been declared by Srila Prabhupada and the GBC that Srila Prabhupada alone is the Founder and Acarya ("Founder-Acarya") of ISKCON, it means that only he acts as its diksa guru. 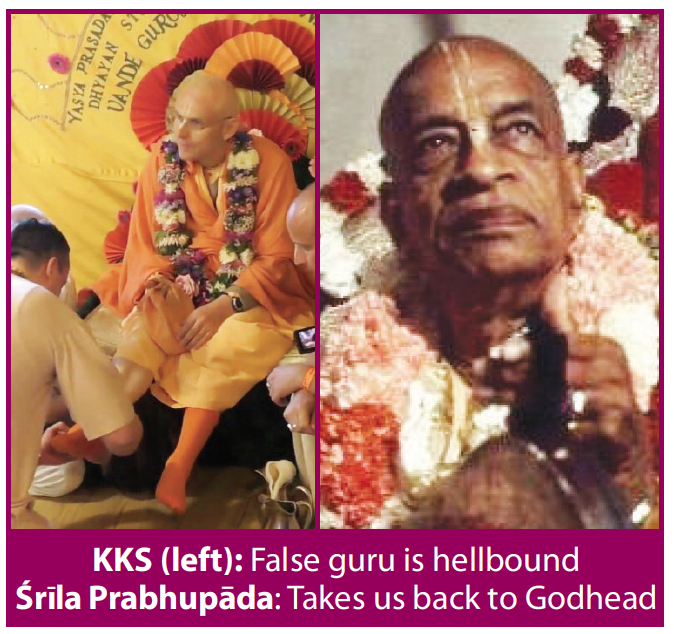 Thus, Kadamba Kanana Swami is again himself explaining how he is a false guru, since he has usurped Srila Prabhupada's position as ISKCON's diksa guru. "Firstly, there must be a foundation of scripture. When there is no foundation of scripture, then such a self-manifested guru, who just suddenly became divine, can never be trusted." "Guru cannot be self made. No. There is no such single instance throughout the whole Vedic literature. And nowadays, so many rascals, they are becoming guru without any authority." "Self made guru cannot be guru. He must be authorised by the bona fide guru. Then he's guru. This is the fact. [...] Similarly, bona fide guru means he must be authorized by the superior guru." 1) Kadamba Kanana Swami became a guru via the GBC voting system, having first been permitted to do so by his own guru, HH Jayadvaita Swami. Yet, in the previous article, we quoted even Kadamba Kanana Swami's guru Jayadvaita Swami and the GBC's Sastric Advisory Council both accepting that such a GBC guru system is not authorised by Srila Prabhupada. And since Jayadvaita Swami himself became a guru by the same GBC system, he is not an authorised guru either. Thus, Kadamba Kanana Swami was made a guru through the combination of an unauthorised GBC voting system and an unauthorised guru Jayadvaita Swami – and by thus "becoming guru without any authority", he is defined as a self-made guru. 2) Kadamba Kanana Swami's point about such a self-made guru "who just suddenly became divine" is also a reference to all GBC gurus. For the system in ISKCON is that as soon as one becomes a GBC guru, they must immediately be worshiped as divine every morning by their disciples via the Gurvastaka prayers. This means that, amongst other things, the GBC-elected guru is supposedly directly "assisting the gopis"! Thus, Kadamba Kanana Swami is again speaking about himself here, and according to his own statement, he "can never be trusted". "The false guru receives the greatest reactions for his actions. Rather than being sura, a devotee of the Lord, he is asura. He is actually demoniac. He is actually a personality who is heading for hellish destinations and taking others down with him. So the followers of such gurus also attain hell." "It is confirmed in Sri Isopanisad that the pseudo religionists are heading toward the most obnoxious place in the universe after finishing with the spiritual mastership business, which is simply for the matter of sense gratification." "if he is a pure devotee he can deliver others, he can become spiritual master. But unless he is on that platform he should not attempt it. Then both of them will go to hell, like blind men leading the blind." However, we have just shown that, according to the logic of his own statements, Kadamba Kanana Swami is himself a false guru, and thus, by his logic, he and his followers will all go to hell. Kadamba Kanana Swami's statements about self-made gurus are also just as applicable to all of his GBC guru colleagues. For they also became gurus without any authority from Srila Prabhupada and usurped his position as ISKCON's diksa guru, just as Kadamba Kanana Swami did. Thus, according to Kadamba Kanana Swami's same logic, all the ISKCON gurus and their disciples will also go to hell.